Properties in Entrecasteaux average 4.6 out of 5 stars. Detached villa with shared pool and summer kitchen. Property 12: Detached villa with shared pool and summer kitchen. Property 18: quiet villa, pool and jacuzzi in the heart of Provence green. 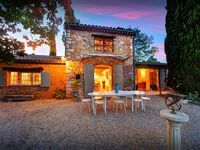 Beautiful Provencal property heated pool. 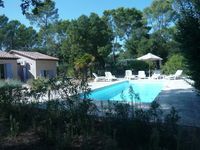 Property 37: Beautiful Provencal property heated pool. The villa is well equipped, large and certainly sufficient to host 10 (2x5) people. With 2 bathrooms, 2 livings, 2 kitchens ... it's just spacious. The equipment is of good quality and has all what you need. Enjoyed the BBQ area. The environment is perfect. Villecroze, Salernes, Cotignac all in about 15min distance. Tourtour, a bit further, is a must to visit. A good 40min only to Lac de Sainte-Croix (Verdon) where the town Bauduen is a good start. Great swimming. A good hour away you have Fr&eacute;ju and St-Rapha&euml;l. Great places to visit. It takes a bit further to Casis, but certainly worth while for a boat trip. Drive over the mountain to La Ciotat (incredible view! ), which is a very nice town to visit (more activity as in Casis). So not only a perfect villa, but situated so that you can visit a very large area with interesting towns.